Having never visited the track in the coastal South Australia town of Whyalla, the team didn’t quite know what to expect heading into the South Australian Title event, but it certainly didn’t take them long to figure out. Starting out of position two in the 30-lap feature race after a competitive run throughout qualifying, Madsen set about chasing down pole sitter and early race leader Brad Keller, eventually managing to pip him on lap eight, going on to survive numerous cautions to earn a comfortable victory, some two seconds ahead of his nearest rival. 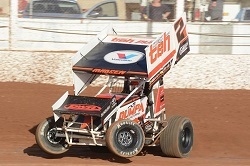 This South Australian Title victory concluded what was a pleasing two-show addition to Krikke Motorsport’s 2018-19 season calendar, with the Bunbury, Western Australian-based team also placing second at Toowoomba’s Hi-Tec Oils Speedway during the $10,000 to win Mayor’s Cup the previous weekend. “It was an enjoyable night to go out and support a country track, and what topped it off was coming away with the South Australian Title win,” commented Madsen, who had earlier in the night recorded the fastest lap in his time trials group, finished second and fifth in his two heat races and then place second in the pole shuffle. Madsen also participated in a celebrity Streetie Challenge last Saturday night, which was organised by the Westline Speedway committee, racing a local Street Stock against World Series rival James McFadden, with Madsen coming out on top. The Krikke Motorsport team will now return to their home state of Western Australia to contest the final three WSS rounds, with their next appearance being this Saturday night at Albany’s Attwell Park Speedway, followed by a doubleheader for the final two rounds at the Perth Motorplex on February 22 and 23. With Madsen leading Steven Lines in the current WSS point standings by just eight points, followed by McFadden, who is 126 points off the pace, the final three championship rounds will no doubt produce a close three-way battle between the trio, but Krikke Motorsport have every confidence in their driver to get the job done. Krikke Motorsport’s range of 2018-19 season team and Madsen merchandise, which includes hoodies, hats, t-shirts, raglan three-quarter sleeve shirts and kids’ t-shirts, is available for purchase at the track from the team’s transporter. A limited range of stock is also available via the team’s online store at www.krikkemotorsport.store. To keep up-to-date with the Krikke Motorsport team, visit their website at www.krikkemotorsport.com.au or follow them on Facebook, Instagram and Twitter by searching Krikke Motorsport.